Nashville’s Centennial Park features a one-mile path that loops around the park. On this stunning spring day in the park, parents push strollers and couples hold hands under the cornflower blue sky. Tourists whip out their iPhones to take pictures of Nashville’s very own Parthenon. Runners are a common sight – no one pays much attention to the tall blonde-haired man, although he’s already circled the park several times. This is his final run before the big day and I’m joining him for a few miles. I ran a 5K earlier in the morning, making it challenging to keep up with him, but I don’t want to hold him back. As we run, we chat about the beautiful weather, how bad Lake Watauga smells since it’s been drained (like a pile of rotting fish), and the fact that his months of training are finally coming to an end. After a few miles, my tired legs can no longer keep up with his. I wish him good luck on the rest of the run and leave him with a container of chocolate milk from the Purity Dairy Dash. He thanks me more graciously than necessary and puts it in the carefully packed cooler in his car. He’s training for his first Marathon, an achievement he doesn’t plan to repeat. But he does have something to prove. He’s trained hard, squeezing the training runs into his already busy schedule as a litigation attorney. He has enjoyed the support of his girlfriend, his running coach, co-workers, colleagues, family and friends. But the training has taken a toll. Although he looks younger, he is 60 years old and running on two partially-replaced hips. Because of those hips, he has to be careful where he runs these long runs, the most crucial of the weekly training runs needed to get to the Marathon. After a physically and mentally draining 16 mile long run on a track (for the cushioning), he moved his long runs to Centennial Park and Belle Meade Boulevard. He fits in his hill training by running Percy Warner Park’s 5.8 mile trail before work. He may look like an ordinary runner, but he is not. A survivor who wasn’t running but was standing at the finish line of the 2013 Boston Marathon when the bombs went off. Along with the other surivors, he received an invitation to run the 2014 Marathon, an invitation he accepted because he knows it won’t be offered again. You might not expect to find a survivor of the Boston Marathon bombings in Nashville, but Phil was waiting for his girlfriend Vicki to cross the finish line when the bombs went off. In addition to witnessing the horrific attack, he is living with incessant and possibly permanent hearing problems caused by the blasts. He accepted the invitation to run the Boston Marathon, despite the hips, despite the busy schedule, and despite the fact he has never before run a Marathon. In fact, he thought his running days were behind him. But he’s been training purposefully to be able to run 26.2 miles to that same finish line where the attack took place. 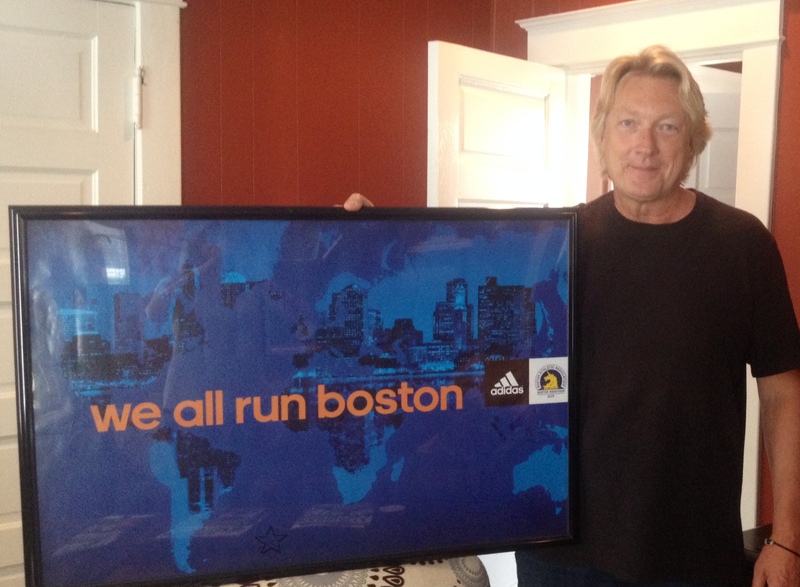 For runners, the Boston Marathon is the pinnacle of running accomplishment. The qualifying times are ultra strict. For a woman my age to qualify, I would have to run a marathon in 4 hours or under, which is at least an hour faster than I could ever dream of finishing. They say that running Boston is unlike running anywhere else, and I can’t even imagine how wonderful it would feel. To take the Boston Marathon and turn it into a setting for terrorism was unthinkable. Last year, I watched the coverage on television, not comprehending the level of bloodshed until I realized that the sidewalk was red because it was covered in blood. As horrifying as it was to watch on TV, I can’t imagine what it was like to be there in person and see the blood-covered bodies blown apart by the bombs. When I see Dzhokhar Tsarnaev on a magazine cover, he is the surviving perpetrator of an attack that took place hundreds of miles away. For Phil, Tsarnaev’s actions were obviously much more personal. Phil is headed to Boston to run the Boston Marathon this week, the culmination of challenging training and an even more challenging year. He isn’t running to win the Marathon, or to set a PR, or even for the great gear, but to prove that he can. Edited to add: Phil crossed the finish line in 5:29:09, faster than his “hoped for” time of 5:30. This entry was tagged Boston Marathon, running. Bookmark the permalink.